What is "sugar"? It's a word with a double meaning. In one meaning, it refers to two types of carbohydrates (monosaccharides and disaccharides) conventionally called "sugars." 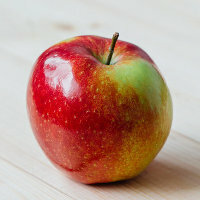 Many carbohydrate foods, such as apples, carrots, potatoes, and milk, contain them. When these foods are chemically analyzed, these natural sugars are found. In another meaning, it refers to a refined product: white table sugar, which in chemical terms is pure sucrose (one of the disaccharides). Some other refined products, such as high-fructose corn syrup, have the same taste as table sugar and are used as sweeteners. These sweeteners are pure or mostly pure sugars. This article discusses: first, what refined, concentrated, and added sugars are and why we care; and second, what are the most important chemical terms--all of which have a double meaning! Those chemical terms--glucose, fructose, galactose, sucrose, lactose, and maltose--can be names for components of a natural food, discovered by analysis; or they can be purified substances added to processed foods. Below you can read where they are found in nature and where found in industry. To see approximately 150 names for these sugars--refined, partially refined, concentrated, and added--click here. It's true that "sugars" are found naturally in fruits, vegetables, grains, and milk--but for a sugar free diet, we're not concerned about those sugars. Your body is naturally equipped to eat foods in their whole, natural state. No, we're concerned about refined, concentrated, or added sugars that overwhelm the body's ability to use them and over time actually damage the body. Refined sugar is a chemically pure product made by industrial processing. As an ingredient on a food label, it might be listed as "sugar," "dextrose," "high-fructose corn syrup," or any of a number of terms. An example is the white table sugar available at the grocery store, which is pure sucrose made from sugar cane or sugar beets. Refined sugar contains calories, but no nutrients ("empty calories"). Concentrated sugar is a less-pure sugar product made by processing fruit or other plants. Examples are fruit juice, syrups, and honey. Fruit juice is made by crushing fruit and discarding the pulp. Syrups are made by cooking fruit juice or another high-sugar liquid to make it thicker and more concentrated. Bees make honey by digesting the nectar of flowers. (Yes, they regurgitate it!) Examples as seen on food labels are "concentrated fruit juice," "brown rice syrup," "molasses," or "honey." Added sugar is, of course, when refined or concentrated sugar is added to a food, as the World Health Organization puts it, "by the manufacturer, cook, or consumer." You may have added it yourself, or a food manufacturer or restaurant may have added it for you. On a food label, it is always listed as a separate ingredient in the ingredients list. Refined, concentrated, or added sugars can also be called free sugars. They're the opposite of a sugar that was naturally grown within the food and naturally embedded in the food. All monosaccharides and disaccharides added to foods by the manufacturer, cook, or consumer, plus sugars naturally present in honey, syrups, and fruit juices. "Monosaccharides" and "disaccharides" are not as difficult as they sound; they're the chemical names for two types of carbohydrates that are conventionally known as "sugars." The rest of this article will describe the six most common monosaccharides and disaccharides: glucose, fructose, galactose, sucrose, lactose, and maltose. Monosaccharides are "simple sugars." They are the simplest forms of the chemical category "sugar" (which is a type of carbohydrate) and are the building blocks of other carbohydrates. The common monosaccharides are glucose, fructose, and galactose. However, when you see a monosaccharide on an ingredients list on a food label, it is a manufactured product that has been added to the food. These products are also used by food manufacturers to make other food products. Glucose is also called dextrose or grape sugar. In nature, it is found in plants, which produce it by photosynthesis. Humans and animals eat the plants that contain glucose and other carbohydrates. We digest carbohydrates into glucose, and use the glucose in our bodies. Glucose is biologically essential: it is used as energy to fuel the activities of the cells and for other functions. The body can also generate glucose in the absence of carbohydrates. In industry, including food manufacture, chemically pure glucose is created in factory processes. It is normally made from corn starch, which is processed into corn syrup (which is nearly all glucose). Corn syrup is processed to forms of glucose such as crystallized dextrose and glucose syrup. Manufactured glucose is used as an ingredient in food and for other industrial products (such as adhesives). It's used in baked goods, beverages, candy, jam and jelly, processed meat, and other processed foods. Alone, it's not normally a sweetener, but is used for other purposes. It is further processed to make high fructose corn syrup (which is about one-half glucose) and other food additives, and it's used as food for fermentation in food manufacturing. When you see a name for glucose on a food label's ingredient list, it means that a manufactured monosaccharide product was added to the food. Fructose is also called levulose or fruit sugar. It is much sweeter than glucose. In nature, it's found in fruit, vegetables, honey, and flowers. Fruits and vegetables contain free fructose, as well as free glucose and sucrose. Each kind of fruit or vegetable contains different proportions of each sugar. Again, this is not normally a problem except in certain medical conditions. Honey is included on the list of concentrated sugars because of its very high fructose content. Bees concentrate fructose when they produce raw honey from flower nectar. Honey found in the supermarket has been further refined with industrial processes. Honey varies in content, but is typically about 38% fructose, 31% glucose, 7% maltose, and 1% sucrose. We humans concentrate fructose by making juices, syrups, and concentrates from fruit and other plants. This can be done at home or commercially--the end result is concentrated sugar. In industry, chemically pure crystalline fructose and related food ingredients are manufactured from corn starch, with corn syrup as an intermediate product. High fructose corn syrup is a manufactured mixture of free fructose and free glucose. The product called HFCS 55, used in soda pop and fruit drinks, consists of 45% free glucose and 55% free fructose. These sweeteners are used in processed foods of all kinds, including baked goods, breakfast cereals, chips and snacks, beverages including soda and fruit drinks, candy, jam, jellies, processed meat, and a seemingly infinite number of processed foods. If you see fructose, high fructose corn syrup, or other syrups on an ingredients list, these are industrial products of pure concentrated fructose or other sugars. In nature, it is found in milk and in smaller amounts in fruit and vegetables. It is made in our bodies and used in immune system functioning. In industry, it is used in sweetening and flavoring of baked goods and other processed foods. A disasccharide is another sugar that is a type of carbohydrate. It is composed of two monosaccharide molecules bonded together. The common disaccharides, sucrose, maltose, and lactose, are each made up of two of the common monosaccharides. As with monosaccharides, a disaccharide seen on an ingredients list is a manufactured product that has been added to the food. In nature, sucrose is found in sugar cane, sugar beets, and in other fruits and root vegetables. 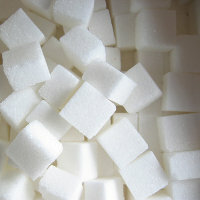 In industry, sucrose is the white table sugar made from sugar cane and sugar beets. Informally, when we say "sugar" we generally mean industrially refined table sugar--which is pure sucrose. It is used in many sweet and sugar-based food products, not only in soda pop, candy, and desserts, but also as a sweetener and an additive to prolong shelf life in processed foods. High-fructose corn syrup substitutes for sucrose in many food products today. It is a close match for sucrose. Sucrose consists of 50% glucose molecules and 50% fructose molecules naturally bonded together. High-fructose corn syrup is a mixture of free glucose and free fructose in approximately equal ratios. Sucrose, as table sugar, has the sad distinction of inspiring slave plantations, exploitation, and wars. In nature, lactose is found in milk. In industry, it is made from dairy industry byproducts. It's used as a filler in pharmaceuticals, in flavorings, and in infant formula. In nature, maltose is found in germinated barley and other germinated seeds. Traditionally, grains were "malted" and used to make beer and in baking. In malting, the grain is soaked until it germinates and then it is dried; food enzymes naturally create maltose and other sugars in the malted grain. In industry, sweeteners and additives are made that contain maltose, whether from malted grain, from flour, or from starch, via cooking and enzymes. Examples are barley malt syrup (65% maltose) and brown rice syrup (45% maltose). Continue on to the list of names for sugar to see the monosaccharide, disaccharide, refined, concentrated, and added sugars that appear in ingredients lists on food labels.